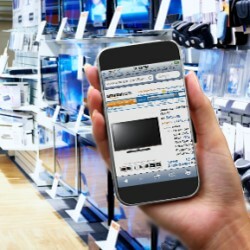 29% of consumers who use a smartphone to research a product while at any retail store end up purchasing the item from an online only retailer, according to a recent consumer perception study conducted by leading market research firm ClickIQ. Furthermore, these consumers are more likely to be men. Market research firm ClickIQ went to nearly 3800 U.S. consumers to ask them if, and how, their mobile devices play a part in their in-store shopping experience. The intent of the survey was to talk only to shoppers who used their mobile devices to research products while they were in the retail store and either then or later, purchased the product. While 66% of the surveys were initially sent to women and 34% sent to men, those who qualified to complete the survey (406) were nearly equal among gender with 53% and 47% respectively. Since 15% of the men and only 8% of the women met the qualification, this provides a strong indication that in-store mobile researching is performed more often by men. The study also indicated that males are more likely to not purchase the researched product while at the store but will instead purchase the product later from an online retailer. Of the 29% who used a smartphone to research in the retail store and then indicated they purchased from an online only retailer, 55% were males and 45% were females. According to the survey findings, age also plays dominantly in who uses mobile technology to research while at the retail store. As would be expected, the younger generations are adept at using the latest technology and including it as part of their shopping experience. 26% of those ages 30-39 and 25% of those ages 18-29 recently used a mobile device to research a product while in the brick & mortar store. Conversely, the numbers fall drastically from there with only 12% of those ages 40-49, 6% of those ages 50-59 and 2% of those ages 60 or over researched in a store using a mobile device. The study dug deeper to find out which retailers these technology enabled shoppers visited to research a product and where they eventually purchased the product. The respondents possibly visited more than one retailer but the study shows that the retailers most frequented for research by these respondents were Best Buy (BBY) at 36%, Walmart (WMT) at 30% and Target (TGT) at 29%. In this study, Best Buy had more males (56%) do online research in the store than females (44%). When it came to using a mobile device for research at Walmart and Target, the opposite was true. Walmart had nearly twice as many females (62%) as males (32%) and Target came in close to gender-even with 54% females and 46% males. When breaking out the key age group of 30-39, at Best Buy males (47%) far outnumbered females (28%) in mobile researching. For that same age group at Target and Walmart, gender did not play as big a role with 31% males and 37% females mobile researching at Target and 25% males and 24% females at Walmart. To find out what happened after the in-store research was complete, respondents were asked to state where they eventually purchased the product they were researching. From the survey results, Best Buy did the best job of retaining the sale. 35% of those that researched at Best Buy ended up purchasing at the Best Buy store with another 14% purchasing at http://www.bestbuy.com. Another 21% purchased the product from Amazon (AMZN). Of those that did their research at Target, 29% purchased at the Target store, 8% purchased at http://www.target.com and 21% purchased from Amazon. Walmart retained 26% who purchased at the Walmart store and 10% who purchased at http://www.walmart.com. Walmart lost 24% to Amazon. When respondents were asked why they made the purchase where they did, an overwhelming 67% stated price as the determining factor. Lagging behind was availability at 14%, features at 8%, free shipping at 7%, and already at the store 4%. Data was collected in an online survey from 3780 of ClickIQ’s U.S. consumer panel members from March 2, 2012 through March 8, 2012. Target respondents must have shopped in a retail store within the past 3 months and also own a mobile device. 406 were further qualified by stating that they used the mobile device while at a brick & mortar store to research a product and have since purchased the researched product. The survey results have margin of error of +/-5% at a 95% confidence level. ClickIQ, Inc., based in Minneapolis, Minnesota, is an award-winning market research firm that employs fully integrated online management tools, a proprietary consumer panel, and skilled market research analysts to deliver quantitative consumer and shopper insights to some of the best known and most respected companies across the U.S.